The ideal school librarian would know every student in the school – what their interests are, what their current reading level is and what their teachers will be teaching next. With this knowledge, she would use her comprehensive knowledge of the school's book collection to suggest books or activities that would be both enjoyable and yet challenging to the student's abilities. That is, books that are in the student's Zone of Proximal Development. It's not really possible for a librarian to have such a comprehensive view of both students and the book collection. But under Race to the Top grants, several states are developing Instructional Improvement Systems that, among other things, will support recommendations like these. Such systems operate at the intersection of student data and content data. And to support them, inBloom (formerly the Shared Learning Collaborative) is deploying student and content data services. The Common Core State Standards (CCSS) and the Learning Resource Metadata Initiative (LRMI) work together to support the content data side when teaching reading and writing. The CCSS for ELA-Literacy have two dimensions to their basic structure. The grid below shows one way to view the Common Core Standards for Reading. Making up the horizontal dimension are Anchor Standards 1-9. These describe specific skills that the student should be able to apply when reading. The vertical dimension is Anchor Standard 10, the requirement that the other nine anchor skills should be demonstrated against texts of increasing difficulty as the student advances from Kindergarten to 12th grade. Notably, grades 9 and 10 share a level as do grades 11 and 12. Notice how this last statement is a refinement of anchor standard 6 targeted at a Grade 4 skill level. So, a source text or learning activity that satisfies RL.4.6 would have a text complexity level in the grade 4-5 text complexity band and it would at least use a first-person or third-person narration. Ideally the activity would include both narration forms and give the student a chance to contrast the two. So, what are these text complexity bands and how do we tell whether a text is within a particular band? In other words, how do we place a text or learning activity on the vertical dimension? Appendix A of the Common Core State Standards for English Language Arts describes a three-factor model for measuring text complexity. 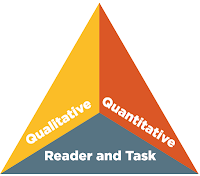 The qualitative factor refers to levels of meaning, structure and demands for prior knowledge on the part of the reader. "Reader and Task" considerations involve matching texts to the reader's needs or interests and the learning tasks that will be associated with the text. The quantitative factor is a numerical measure that is calculated (usually by computer) from word length and frequency, sentence length, vocabulary and text cohesion. A supplement to Appendix A lists six approved scales for indicating quantitative text complexity for the Common Core. The table below indicates which levels are appropriate for certain grade ranges. The grid diagram also includes an example of how a source text might be fully aligned to the common core literacy standards. In this case, To Kill a Mockingbird is shown as an appropriate text for teaching standards 1-7 at grades 9 or 10. 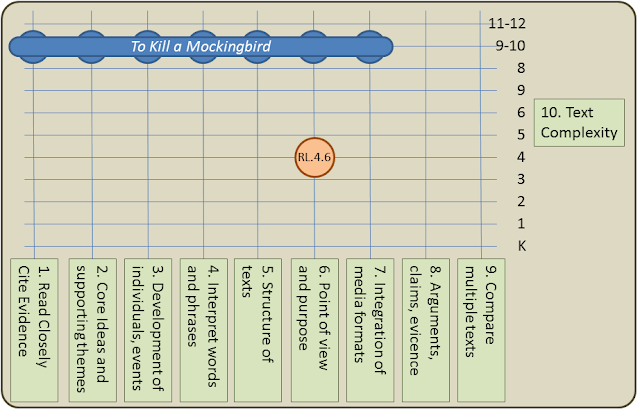 So, the LRMI metadata for To Kill a Mockingbird would include alignment to standards RL.9-10.1, RL.9-10.2, RL.9-10.3, RL.9-10.4, RL.9-10.5, RL.9-10.6, and RL.9-10.7. 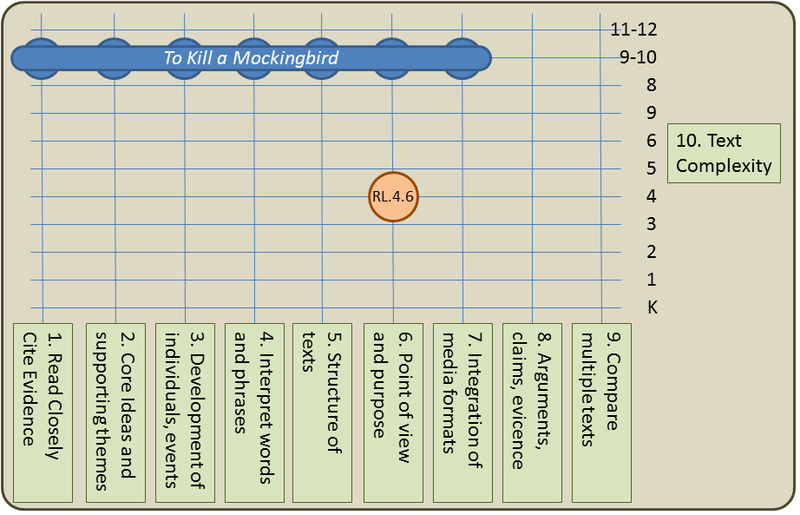 On the vertical dimension, To Kill a Mockingbird is positioned toward the middle of the grades 9-10 range. So, it would be considered moderately advanced for grade 9 and moderately easy for grade 10. To Kill a Mockingbird is rated an 870 on the Lexile scale. A quick glance at the table shows that 870 is in the 4th-5th grade range. The book is positioned higher on the grid than the raw Lexile number would indicate due to qualitative factors such as the complex moral dilemmas posed by the text. The LRMI metadata schema is designed to be flexible enough to represent all of these dimensions. The AlignmentObject type represents the relationship between a text or learning activity and a node in a framework or taxonomy. The most obvious and common way this is use is with a alignmentType of "teaches" or "assesses" and the target node being a statement in the Common Core State Standards. In the To Kill a Mockingbird example, the "teaches" alignmentType would be used with targets of the six standards (RL.9-10.1 to RL.9-10.7). Any one of these six standards also implicitly brackets the vertical, text complexity dimension. In order to more finely position a resource, LRMI also defines a "textComplexity" alignmentType. Publishers of at least two of the quantitative frameworks listed above are in the process writing guidelines for their use with LRMI. It's also possible to use LRMI to indicate non-quantitative factors. To do so, we would need to define taxonomies for qualitative and "reader and task" factors with appropriate identifiers. In these examples I've used Common Core Standards for Reading but the writing standards have a similar two-dimensional structure. Overall, it's a rich framework with great promise for improving student literacy. We have achievement standards (CCSS) and data standards (LRMI). There are emerging services like inBloom that build on these standards. I expect very soon a combination of CCSS, LRMI, open libraries of content and custom recommendation engines will offer students custom reading lists and writing activities tailored to their individual learning needs.